Each year, the editors of Wiley’s Macromolecular journals select the best content published in the journals to feature in a special annual edition, Best of Macromolecular Journals. This year’s “Best of” features a sneak peek at each of the articles selected, along with interviews with the authors – ever wondered what inspires their research, or what they get up to outside of the lab? Then have a look at the “Meet the authors” section for more! 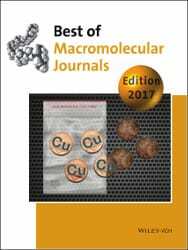 All articles featured in the Best of Macromolecular Journals 2017 Edition will be available to read for free on the Wiley Online Library. Keep an eye out for our Best of Macromolecular Journals booklet, which will be distributed at conferences throughout 2017. To see more Best of Macromolecular Journals from previous years, please click here. Read about our distinguished authors and find the answers to questions you’ve always wanted to ask! Summaries and links to the freely available articles featured in this year’s Best of Macros. Find out more about the team of professional editors responsible for the Macromolecular journals. Best of Macros To Go! Download the Best of Macromolecular Journals booklet in PDF format to take away and read at your leisure.